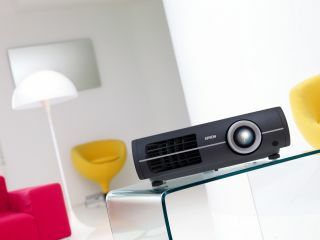 Epson has unleashed it latest range of projectors onto the UK market, complete with pricing and release dates. We brought you news on the launch during our huge IFA coverage, with all projectors using Epson's 3LCD technology, providing high brightness with good colour reproduction. The pick of the bunch is the EH-TW5500, which features a whopping 200,000:1 contrast ratio, 1080p resolution, 1600 lumen output and 12 bit video processing, with a super quiet 22db fan. Costing a huge £4,000, it will at least have a five year lamp warranty, and has a UK release date of November. The next in line is the TW4400, which has a 130,000:1 contrast ratio and will set you back around £1,099 when it appears in November. The other releases include the TW2900, a 1000 lumen effort coming in at £1,099 from October, as well as the TW3500, which packs 30,000: contrast ratio into a device costing £1,299. And for the final flurry, the EH-DM3 and the TW450 complete the line up, with the former coming in November this year for £549, and the latter, designed to be a simple plug and play effort for gaming and movies, costing £640 and debuting later this month.